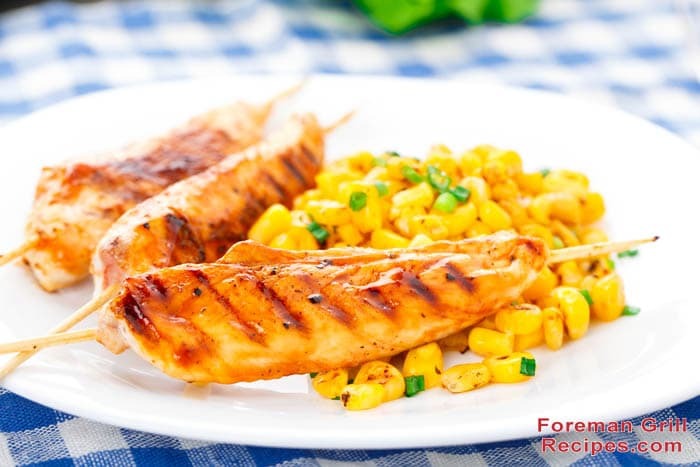 Here’s a very easy recipe for delicious honey dijon chicken skewers that’s fun to make and everyone will love. There’s just something about the combination of flavors of dijon mustard and honey that perfectly complements chicken. It really is the perfect combination of sweetness and boldness without overwhelming the senses. There are so many different kinds of dijon mustard available so feel free to experiment. As a general rule of thumb, use a equal amounts of dijon and honey. Some people prefer to use slightly more honey to offset the sometimes powerful taste of certain dijon mustards. You can always adjust this to suit your taste. Prepare chicken breast by cutting into 1inch wide strips. Make sure chicken is no more than 1/2″ thick too. This is best for grilling on a Foreman Grill. Combine orange juice, lime juice and soy sauce in a ziploc bag and marinate chicken for at least an hour in the refrigerator. Overnight is best! Preheat your Foreman Grill for at least 5 minutes with the lid closed. Use high setting if you have it. While grill is warming up, place chicken pieces on skewers. Also you can mix up the honey and mustard sauce now too. Just add the 2 ingredients together and mix well. Set aside. Place chicken skewers on grill and close lid. Grill chicken for 3-5 minutes. Be sure to check for doneness. No pink in the middle and should have an internal temperature of 165F. After mixing honey and mustard together set aside when do u put it on chicken before or after cooking. I was wondering sane thing?? After. As a dipping sauce. At least that’s what I gathered after reading the directions.